Next, I'm going to read a list of problems facing the country. For each one, please tell me if you personally worry about this problem a great deal, a fair amount, only a little or not at all? How much do you personally worry about the quality of the environment? Do you think [...] is doing a good job or a poor job in handling each of the following issues as president? How about protecting the nation's environment? ^ WORDING: "...will do a good job or a poor job..."
Do you think the U.S. government is doing too much, too little or about the right amount in terms of protecting the environment? How would you rate the overall quality of the environment in this country today -- as excellent, good, only fair or poor? Right now, do you think the quality of the environment in the country as a whole is getting better or getting worse? 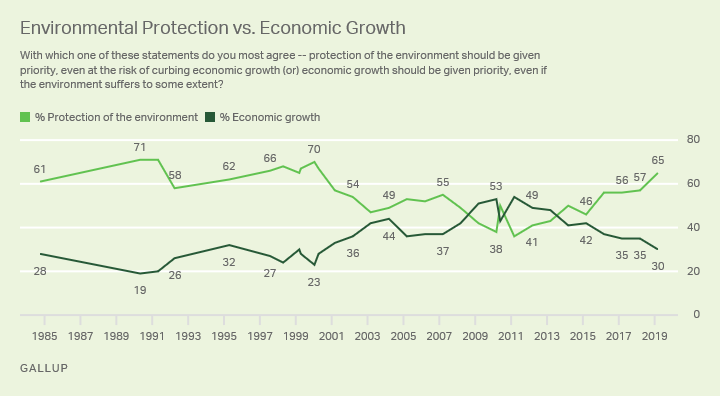 With which one of these statements about the environment and the economy do you most agree -- protection of the environment should be given priority, even at the risk of curbing economic growth (or) economic growth should be given priority, even if the environment suffers to some extent? I'm going to read you a list of environmental problems. As I read each one, please tell me if you personally worry about this problem a great deal, a fair amount, only a little or not at all. First, how much do you personally worry about -- Maintenance of the nation's supply of fresh water for household needs? I'm going to read you a list of environmental problems. As I read each one, please tell me if you personally worry about this problem a great deal, a fair amount, only a little or not at all. First, how much do you personally worry about -- Contamination of soil and water by radioactivity from nuclear facilities? Next, thinking about the issue of global warming, how well do you feel you understand this issue? Would you say -- very well, fairly well, not very well or not at all? Which of the following statements reflects your view of when the effects of global warming will begin to happen -- they have already begun to happen, they will start happening within a few years, they will start happening within your lifetime, they will not happen within your lifetime, but they will affect future generations, (or) they will never happen? 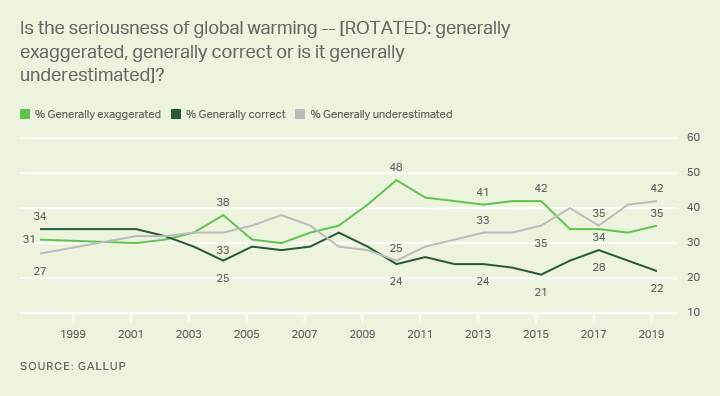 Thinking about what is said in the news, in your view is the seriousness of global warming -- generally exaggerated, generally correct or is it generally underestimated? Just your impression, which one of the following statements do you think is most accurate -- most scientists believe that global warming is occurring, most scientists believe that global warming is NOT occurring or most scientists are unsure about whether global warming is occurring or not? And from what you have heard or read, do you believe increases in the Earth's temperature over the last century are due more to -- the effects of pollution from human activities (or) natural changes in the environment that are not due to human activities? Do you think that global warming will pose a serious threat to you or your way of life in your lifetime? Next, I'd like you to think about the weather in your local area this winter season compared to past winters. Have temperatures in your local area been -- colder than usual this winter, about the same (or) warmer than usual this winter? (If colder/warmer:) Do you think temperatures are [colder/warmer] mainly due to [human-caused climate change/global warming] (or to) normal year-to-year variation in temperatures? Next, we'd like to know how you feel about the state of the nation in each of the following areas. For each one, please say whether you are -- very satisfied, somewhat satisfied, somewhat dissatisfied or very dissatisfied. If you don't have enough information about a particular subject to rate it, just say so. How about -- the quality of the environment in the nation? Do you consider yourself an environmentalist, or not? Do you consider yourself an environmentalist, or not? Would you say you are a strong environmentalist, or not? With which one of these statements about the environment and energy production do you most agree -- [ROTATED: protection of the environment should be given priority, even at the risk of limiting the amount of energy supplies -- such as oil, gas and coal -- which the United States produces (or) development of U.S. energy supplies -- such as oil, gas and coal -- should be given priority, even if the environment suffers to some extent]? Next, I am going to read some specific proposals. For each one, please say whether you generally favor or oppose it. How about -- Expanding the use of nuclear energy? Next, I am going to read some specific proposals. For each one, please say whether you generally favor or oppose it. How about -- Opening up land owned by the federal government for oil exploration? Next, I am going to read some specific proposals. For each one, please say whether you generally favor or oppose it. How about -- More strongly enforcing federal environmental regulations? Next, I am going to read some specific proposals. For each one, please say whether you generally favor or oppose it. How about -- Setting higher emissions standards for automobiles? Next, I am going to read some specific proposals. For each one, please say whether you generally favor or oppose it. How about -- Setting higher emissions and pollution standards for business and industry? Next, I am going to read some specific proposals. For each one, please say whether you generally favor or oppose it. How about -- Spending more government money on developing solar and wind power? Next, I am going to read some specific proposals. For each one, please say whether you generally favor or oppose it. How about -- Imposing mandatory controls on carbon dioxide emissions and other greenhouse gases? Next, I am going to read some specific proposals. For each one, please say whether you generally favor or oppose it. How about -- Setting stricter standards on the use of techniques to extract natural gas from the earth, including "fracking"? Next, I am going to read some specific proposals. For each one, please say whether you generally favor or oppose it. How about -- Passing a carbon tax to encourage reductions in carbon dioxide emissions? Next, I am going to read some specific proposals. For each one, please say whether you generally favor or oppose it. How about -- Spending government money to support the coal industry? Next, I am going to read some specific proposals. For each one, please say whether you generally favor or oppose it. How about -- Spending government money to develop alternate sources of fuel for automobiles? Next, I am going to read some specific proposals. For each one, please say whether you generally favor or oppose it. How about -- Setting higher fuel efficiency standards for automobiles? Next, I am going to read some specific proposals. For each one, please say whether you generally favor or oppose it. How about -- Setting legal limits on the amount of energy that average consumers can use? Next, I am going to read some specific proposals. For each one, please say whether you generally favor or oppose it. How about -- Providing tax deductions to Americans who spend money to increase the energy efficiency of their homes? Next, I am going to read some specific proposals. For each one, please say whether you generally favor or oppose it. How about -- Opening up the Arctic National Wildlife Refuge in Alaska for oil exploration? Thinking about the environmental movement, do you think of yourself as -- an active participant in the environmental movement, sympathetic towards the movement, but not active, neutral, or unsympathetic towards the environmental movement? Finally, as you may know, scientists recently reported that 2015 was the Earth's warmest year on record. Had you heard about these reports before now, or not? Just your best guess, do you generally believe these reports are accurate or not accurate? Assuming these reports are accurate, do you think the record temperatures in 2015 were mainly due to -- [ROTATED: human-caused climate change (or to) natural changes in the Earth's temperatures]? Is your local area experiencing a drought -- that is, a serious shortage of rainfall -- this year, or not? (Asked of those experiencing drought) Do you think the drought is mainly due to -- [ROTATED: global warming (or to) normal year-to-year variation in rainfall]? Which comes closer to your view -- [ROTATED: it is possible to take specific actions that will slow down the effects of global warming (or) the effects of global warming are part of a natural process that can't be altered]? All things considered, do you think the environmental movement in this nation has done more good than harm, or more harm than good? Would you say it has done -- definitely more good than harm, probably more good than harm, probably more harm than good or definitely more harm than good? As you may know, representatives from around the world are gathering for a United Nations conference on global climate change in Copenhagen. Do you favor or oppose the U.S. signing a binding global treaty at the Copenhagen meeting that would require the U.S. to significantly reduce greenhouse gas emissions? All in all, which of the following best describes how you feel about the environmental problems facing the earth -- life on earth will continue without major environmental disruptions only if we take additional, immediate and drastic action concerning the environment, we should take some additional actions concerning the environment, or, we should take just the same actions we have been taking on the environment? Thinking about your own shopping and living habits over the last five years, would you say you have made major changes, minor changes or no changes to help protect the environment? Make home more energy efficient -- install new windows, insulation, solar panels, etc. Do you think the effects of global warming can be controlled if most people take steps such as driving less, recycling, and turning down their thermostat, or will more drastic measures be needed? How much of a factor should the environmental record of a company be when you are deciding whether or not to buy one of its products? Should it be -- the most important factor, important, but not the most important factor, or should you not take this into account when deciding to buy products? All in all, how good a job would you say you, personally, are doing in protecting the environment? How much progress do you think has been made in dealing with environmental problems over the past twenty years? Would you say there has been a great deal of progress, only some progress or hardly any progress at all? ^ Asked of a half sample; # WORDING: "...in the past few decades -- say since 1970...."
How much optimism do you have that we will have our environmental problems well under control in twenty years -- that is, by about 2027 -- a great deal of optimism, only some optimism or hardly any optimism at all? Thinking about the increase in strength of hurricanes in recent years, do you think global warming has been a major cause, a minor cause or not a cause of the increase in strength of hurricanes? Four decades after the Three Mile Island nuclear accident, Americans are evenly split on the use of nuclear energy.